In the mist of mid-October, we climbed 57 steps leading to Washington, D.C.’s Lincoln Memorial. An old, sad memory recalled my childhood visit to Henry Ford’s Greenfield Village Museum. There, I saw President Lincoln’s chair and learned the awful meaning of the word assassinated. Also bearing their personal perception of America’s sixteenth president, tribes and tongues from around the globe gathered on the memorial’s stairway. My first visit to D.C, the place seemed foreign. It was the common language of children’s laughter I understood—a defining moment on the west end of the Reflecting Pool. I scanned the long pond to the Washington Monument, the obelisk’s simplicity a pointed contrast to the Doric columns of Lincoln’s Memorial. I praised our country’s fathers who proposed the contemplative design and entered Lincoln’s temple with outer and inner eyes. I had waited a lifetime to honor the native Kentuckian, so I didn’t rush into his presence. 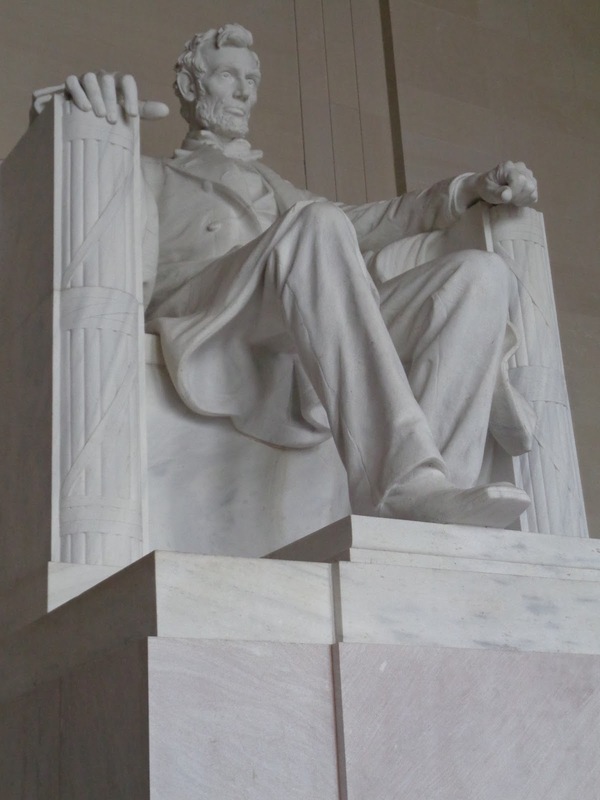 Some have described the Lincoln sculpture “severe and serene.” To me, his posture seems restless, poised to rise and walk away from his hallowed hall. Mel and I read his words inscribed on the walls and admired the frescoes above. Whether he would have approved or not, “In this temple as in the hearts of the people for whom he saved the Union, the memory of Abraham Lincoln is enshrined forever." Afterward, we walked down the steps and consumed a high-carb over-priced lunch before we strolled the Mall and WW II Memorial. We found Guam, my father’s battleground, in the structure representing Service, Sacrifice, Unity, Victory. Later, with help from whomever we could hail, we found the Smithsonian National Portrait Gallery. What a gem! We stumbled upon the reinstalled Presidential Portrait collection, and expanded our founding fathers and presidential tour from monuments to paintings. The gallery displayed our 44 past presidents in chronological order, a profound art and history lesson. Since my father was Warren G. Harding’s namesake, I was glad to find Harding’s likeness between Woodrow Wilson and Calvin Coolidge. The 29th president, Harding was six of eight presidents to die in office. My father was the last of eight children. Family legend says his sister, Golda Mae, named him. Dear Reader, October 24 I celebrated Dad’s 95th birthday in the privacy of my heart and home. 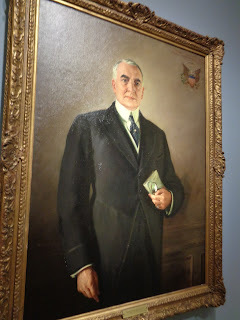 Warren G. Harding O’Brien wasn’t a national giant like Washington and Lincoln. You won’t find his name carved in Washington, D.C. Yet, he fought for my freedom from tyranny before I was a glimmer in his eye. He provided food, clothing, and shelter for his family until his addiction divided us. My father left no debt and his wallet behind. I find comfort in his miniature, laminated Honorable Discharge from the United States Marine Corps. I marvel at the worn Free Press clipping with Billy Graham’s advice: “A man of understanding holds his tongue.” Proverbs 11:12. To his own grief and loss, not once did Dad speak the horrors of war. Twenty-two years after his passing, I’m learning the soldier’s awful meaning of the word loyalty.